My first look is a beautiful gown from Little 2 Large called L2L Paloma Sequined Dress, and it reminds me of a mature version of Elsa's gown in Frozen. It comes in Dinkies and Petites versions, while the one I am wearing is in plenty of sizes too: classic S, M, L, fitmesh S, M, L, Freya, Venus, Maitreya, Ocacin, Hourglass, Physique, and Voluptuous. The dramatic side slit and off-shoulder styling are so flattering, and the sparkling texture is a winter delight. 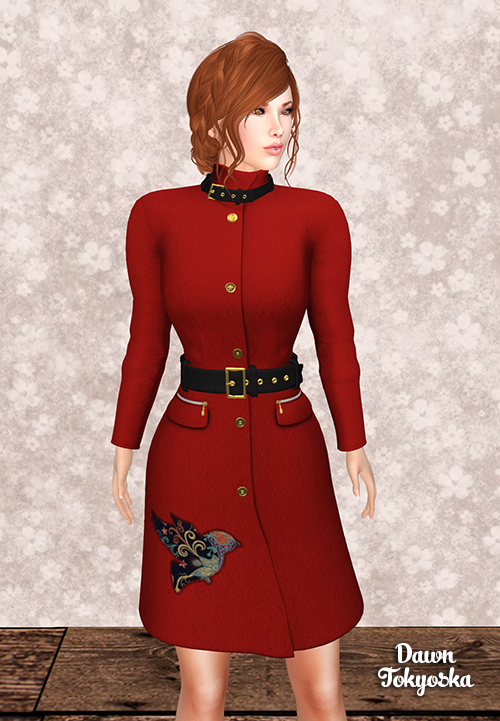 This is the prize from Luziefee called LUZ - POE 18 Coat, a very polished look with an intricate bird design on the front. The belt at the waist is matched by one holding the collar up, and their gold trim perfectly matches the buttons down the front. This prize includes standard mesh sizes for either classic or mesh bodies to enjoy. For another great coat, be sure to find the globe at Dark Intentions to claim their DI: Hope Coat. It comes in fitmesh standard sizes as well as versions for eBody, Freya, Isis, Venus, Maitreya, Ocacin, Hourglass, Physique, TMP, Tonic Curvy, and Tonic Fine. The grey and black will look sharp against any color accessories you choose to wear with it, and the tulip hem and long bow ribbons add a feminine touch. ASHBURY has two treats inside their globe, one being a holiday shirt for men and the other is this Anya Sweater Dress I am wearing above. It has a very body-conscious shape and a festive design, with delicious looking drinks around the skirt portion. The gift includes sizes for Freya, Isis, Maitreya, Hourglass, and Physique mesh bodies. I have a wonderfully playful outfit for my final look of the evening, courtesy of *Lurve* and called Winter Skating Party Outfit - Violet. The sweater comes in standard mesh sizes plus eBody, Freya, Isis, Venus, Maitreya, Ocacin, Hourglass, Physique, TMP, Tonic Curvy, and Tonic Fine versions, while the skirt is in sizes for Freya, Isis, Venus, Maitreya, Hourglass, Physique, and TMP. 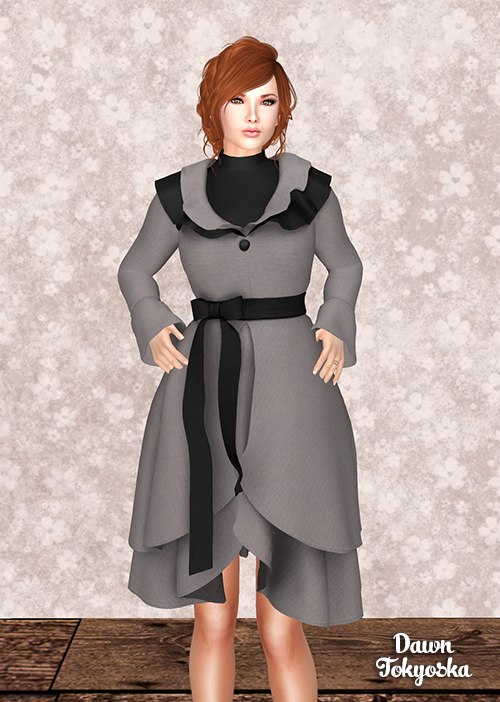 The leggings are provided as system layers plus appliers for Maitreya, Slink, and Omega, and the earmuffs and skates are both included too. This really does dress you from head to toe for your next experience in SL at an ice skating rink or frozen pond. Today was all about resting and recuperating here, I didn't have to go out so that made for a relatively peaceful day. No pun intended there with the name of the hunt or this post ;) Tomorrow I have an appointment unrelated to my recent health issues (chiropractor) then a busy weekend starts, so a day off was nice. I hope you're all having a terrific day/evening, many magical magpie hugs to everyone! !